When Farc leader Alfonso Cano was killed in a military operation on 4 November, Colombian President Juan Manuel Santos said it was the biggest blow to the guerrilla movement in its 47-year history. The 63-year-old had taken over the leadership of the Farc (Revolutionary Armed Forces of Colombia), the country's largest left-wing rebel group, in 2008. Born to a middle-class family in Bogota in 1948, Alfonso Cano, whose real name was Guillermo Leon Saenz, studied anthropology and law at the prestigious National University in the capital. He is believed to have developed a keen interested in left-wing politics during his time as a student, closely following the Cuban revolution. He joined the Communist Youth movement and soon rose to a position of leadership thanks to his way with words and a good grasp of rhetoric. Friends from his university days say he soon became convinced that armed struggle was the best way to fight capitalism, and began expressing sympathy for the Farc. He is believed to have joined the group sometime in the late 1970s, taking on the alias of Alfonso Cano. By 1978, he had been put in charge of fundraising for the group - security forces said he boosted the rebels' coffers through extortion and kidnappings for ransom. His forte was ideology and politics though, and in the early 1980s he took part in peace negotiations between the rebels and the government of President Belisario Betancur. 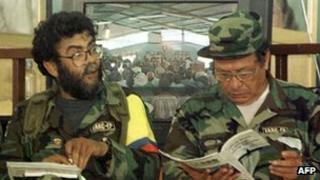 He rose quickly through the Farc hierarchy, professing deep admiration for its chief ideologue, Jacobo Arenas. After Arenas' death in 1990, Cano took over as the group's chief political negotiator and led the rebels' negotiating team at peace talks held in Venezuela in 1991 and Mexico in 1992, both of which ended in failure. During peace negotiations with the government of Andres Pastrana from 1999 to 2002, Alfonso Cano is said to have taken a back seat, reportedly not convinced that the renewed talks were the right strategy for the group to pursue. During this time, he founded the Bolivarian Movement for a New Colombia, a clandestine radical left-wing political group. After the sudden death by natural causes of Farc leader Manuel Marulanda, Alfonso Cano took over the rebel movement's leadership. From that moment on, he became the number one target for the country's security forces. Earlier this year, the military said it had him cornered in his stronghold near Las Hermosas Canyon, in central Tolima province. Colombian President Juan Manuel Santos said the government was breathing down his neck and that military intelligence was so good they knew "what he had for breakfast". However, Cano managed to escape Tolima for the mountains of Cauca province. Police intelligence units believe he took advantage of a Farc hostage release to break through the ever-tightening military cordon. Under the terms for the release negotiated by the International Red Cross, the military agreed to halt its operations in the area for 48 hours. However, when the Red Cross helicopters arrived at the agreed co-ordinates, neither the rebels nor the hostages were there. President Santos said the rebels used the pause in military operations to smuggle Cano out of the area. But in November 2011, the security forces said communication intercepts had helped them pinpoint Cano's location in Cauca. Defence Minister Juan Carlos Pinzon said the presence of some of his personal belongings in the camp, such as his glasses, meant the man himself could not be far. The head of the armed forces, Gen Alejandro Navas, said around 1,000 troops were involved in the final operation which led to his killing and that of several others Farc members. Photos released by the Defence Ministry showed Cano laid out on a tarpaulin, without either his trademark glasses or full beard. Mr Santos said his death was a message to "each and every" member of Farc: "Demobilise... or otherwise you will end up in a prison or in a tomb. We will achieve peace."